One of the problems with having nature as the central theme is that, while you are busy admiring the gold and red leaves and the fruit and seed pods of autumn – nature, who, by now, is totally bored by all this growth, expansion and the constant need to maximise income over expenditure, just nods off – and leaves you standing there, with nothing to write about. This leads to the temptation to write insulting and snide comments in an attempt to stir some response. It is as well to resist this, as it is firstly, pointless, and secondly – always bear in mind, not only does Google gleefully cache all slips of the keyboard for ever and ever after, but this cache immediately becomes available to European, American and Chinese security services to be broken up into sound bites and churned into Big Data. Then, suddenly it’s Spring. This week we have some lovely pictures of our mountains, basking in the morning sun with a crisp clean bedcover of snow. Then, under the hedge on the way to the beck we found some Honesty coming into flower. Our wood is looking magnificent in its bright daffodil yellow jumper. There are hyacinths sprouting among the daffodils on the roadsides. We found some Lungwort with its red and blue flowers by the rookery and the Lesser Celandines are bursting out in the warmer spots. 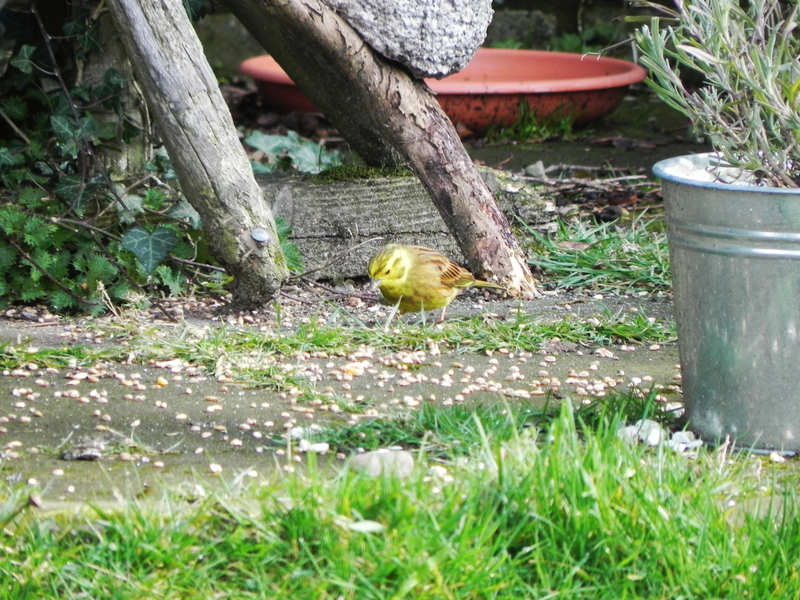 But, in the end, I decided to show you Jackie’s picture of this Yellowhammer, he is on the RSBP ‘Red List’ – meaning there are not many around at the moment. So, I thought you’d better see him before things get any worse. It sounds as if spring has finally sprung! It seems as though we’ve been deceived numerous times here, having balmy temperatures one day, and then several inches of snow the next. Just this past week, we got half a foot of snow. But the trees and flowers are beginning to bloom, and a male and female purple finch have been singing outside my office window each morning. I’m glad you chose to write such a lovely post and were able to resist the temptation to write snarky comments. 🙂 And thanks for sharing the beautiful picture of the Yellowhammer, David. How sad that their numbers are in decline. Your neck of the woods sounds delightful. I’m looking forward to my visit. But by the then the fresh enthusiasm of spring will have passed and it will have settled down into the business of becoming summer. And although it wont be spring, I’m sure there’ll be just as many delights on offer.